If you’ve never been inside Westminster Cathedral near Victoria train station, then you are likely to be in for a bit of a surprise, for despite being over 100 years old, they still haven’t finished decorating it. And I hope they never do – as the contrast it generates between gaudy Catholic decoration and the unfinished brickwork above is amazing. I went in a few years ago for a quick look when in the area for a meeting and had time to waste and have meant to go back for ages to take some photos. Which I finally did at the weekend. The history of the building can easily be found elsewhere, but it seems that when Catholicism was restored to the UK, if they made an attempt to ask for their former Abbey back, it was declined. So they bought a plot of land from the Benedictine monks who established the Abbey and plonked a big Byzantine style Cathedral on that instead. Unlike its gothic neighbour, entry to the Cathedral is free of charge, except for the tower tour or the exhibition area, which makes a pleasant change from the tendency to charge to look around big religious buildings. What I love about the building is that in a way the upper half reminds me somehow of vast Victorian brick arches for railway tunnels, blackened by soot from passing trains. Yet, the lower half is a magnificent display of marble and gold which not only contrasts with the rest, but to my mind, works really well with the plain upper areas. If the whole building was covered with mosaic, it would be too much. Right now, the balance works. The gloomy interior also works well on sunny days to give the bright shafts of light that stand out strongly thanks to the recently finished service pumping loads of incense into the air. A very different effect to that offered by Gothic Cathedrals with their walls of stained glass, but no less mystical. The Treasures of Westminster Cathedral exhibition is a newish display made up partly of a the history of the building, including an impressive wooden model and a side room filled with the sort of gold trinkets that seem to dominate churches for the poor. 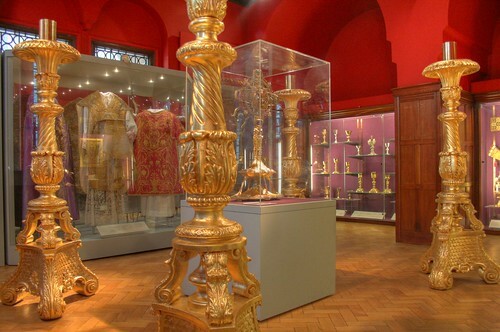 Dotted around the display are the usual cabinets with gold crosses, crowns and bits of religious iconography. A big case with some robes seemed more important to them than I would personally have thought, but they looked very Catholic and suitable for the display. One case full of saintly relics seemed odd in here, as I would have thought they would have been downstairs for worshippers, or maybe relics are not venerated quite so strongly any more? I went up during a service, so couldn’t (and frankly wouldn’t) take a photo in the open area with the wooden model as that is open to the parishioners below, but irritatingly the chap said the service would last at least half an hour more so I decided to leave. The service finished a few minutes later. Time it right, and you’ll get some excellent views of the Cathedral from an higher level than most people normally see it. Entry to the exhibition is £5, which is a tad pricey for what’s there, but if you do the tower tour, then the exhibition is £3 – which is exactly right, and worth paying for. Like most big church buildings, this one has set aside some space in the basement to sit and eat. The Cathedral Canteen is most certainly a canteen though – not a cafe or restaurant. But where else in Westminster can you get a coffee and scone for £2? Thanks for reminding me about this building, I’ve walked past on many occasions, each time thinking I must go inside one day. Next time I’m in London I’ll make sure I do. 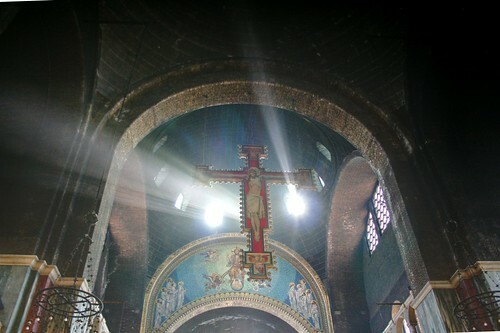 Thanks for writing about Westminster Cathedral – it’s one of my favorite places in London. When I first saw the interior there was hardly any decoration. I was a child and found it a little frightening. Now I too hope they never take it further. and don’t miss the Stations of the Cross by Eric Gill, even though they are slightly at odds with the rest of the internal decoration. The cathedral is a perfect example of achieving near-perfection by chance (well, lack of cash). If you are religious, (I’m not) the dark and gloomy high-level space must suggest the mystery of your beliefs. The tower is a great visit….when I first went up it cost something like 5p. Thanks for the article. Post modern man shouldn’t touch this. Thank you for your interesting post, and for the pictures. I absolutely agree with what you said about the feeling of having all that worldly splendour up to the one level … and then the awesomely dark and beautiful architecture above, reaching to the heavens. I too, hope it is never covered in mosaic! The Catholic Archbishops of Westminster would never have dreamed of asking for ‘their’ former Abbey back – I think that must have been someone’s joke? Relations between these two great churches are very friendly indeed. Also, although Benedictines built Westminster Abbey, they were centuries gone by 1900 and didn’t own any land thereabouts. Catholic Dioceses were restored in 1850 but it wasn’t till 1895 that Westminster Cathedral was founded. Cardinal Manning refused to build it when the Catholic poor needed help and Catholic schooling – but he did buy the land . . . from Middlesex County Council! The next Archbishop of Westminster, Cardinal Vaughan, had his Byzantine / Romanesque / Early Church Cathedral designed by John Francis Bentley; being brick-built it was completed in 8 yrs! Sadly, Bentley died before it was quite finished, and the first Liturgy held there, in 1903, was Cardinal Vaughan’s own Requiem! 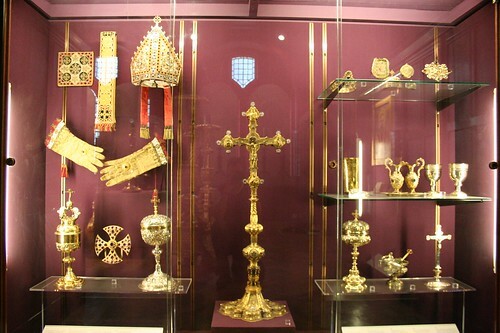 Re the cabinet of relics : it’s there as part of the Sacred Treasury of the Church, and, yes, indeed, relics are venerated regularly at the main altar. Most especially, there is a large glass ‘coffin’ containing the almost complete body of St. John Southworth, a 17th century English Martyr. It is downstairs in one of the side chapels but is put into the nave for his feast day in June, when pilgrims fill the Cathedral. Relics are most definitely still venerated today. 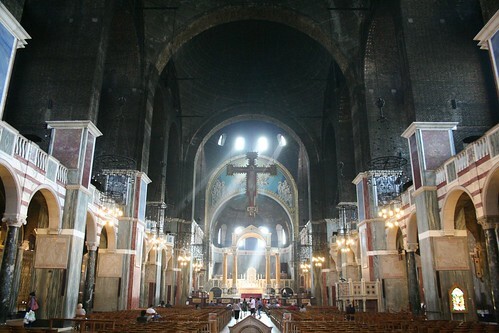 1 Pings/Trackbacks for "The amazingly gloomy interior of Westminster Cathedral"